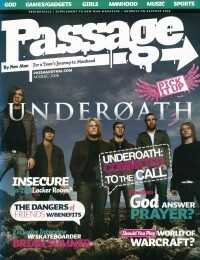 Passage launched as a "flip magazine" on New Man, the issues are attached to the same date of that magazine. The content was aimed at college-age males and covered a broad section of popular culture. In 2007, the title was folded into the publication as a short spread before being eliminated entirely. New Man itself ceased publication at the end of 2007.